The other day, I decided to have a mother’s day out. Despite the dodgy weather, I decided to spice up my little adventure by trying my luck with hailing autorickshaws for a short ride into town. Although I have fallen out of practice in doing it with the kind of deliberate mix of arrogance and indifference that ensures success, I managed to hail one nearly as soon as I got out of home. And then began the famed conversation that abounds everyday in this capital city, with whoever tries their hand at this herculian task — the driver in question began by asking me where I wanted to go, how much I would pay for it, complained that what I was offering was not good enough, informed me about how much more expensive fuel had gotten, how the poor like him were being ground to dust with this government and how I was just the icing on the cake of utter desperation in refusing to pay the inflated amount he was suggesting. By the time he finished his rant, much of it justified, I decided I would not bow to the convenience of just hopping in to his rickshaw but try my luck a second time. The second guy seemed like a gentleman, didn’t ask any questions, said I could pay anything I liked and just as I was about to sit back cosily in the passenger seat I noticed a HUGE Indian flag propped to one side of the rickshaw’s windscreen, a couple of LIT incense sticks behind his steering wheel and immense rudraksha beads wrapped around both his wrists, AND waistbands in the colours of the Indian flag. I was just registering all these rather unusual and mildy worrying details when he turned around, while driving and announced loudly that he was an ardent nationalist, Anna Hazare supporter, and was determined to drive around all day while shouting slogans in the name of the nation and the elderly, self-proclaimed redeemer of the nation, Anna, which he then promptly began to do. He pumped his arms sideways and out and began shouting: “ANNA HAZARE KI JAI HO!! !” “BHARAT MATA KI JAI HO!! !” and this in the middle of a busy street choc-a-bloc with traffic which attracted quite a few puzzled looks from those close enough to watch his pantomime. I took it for a couple of seconds and said as politely and firmly as I could that it was probably not a great idea to have his hands off the steering wheel in the midst of traffic and that his noble social engagement was best left at the maidan where Anna had had a sit in. At first he ignored me. The third time I repeated my request, he decelerated dramatically, stopped his cries midway and declared rather dejectedly that I was not being a good citizen in stopping him from allowing him his freedom of expression and that I was better off on the pavement with a lesser evolved autoricksaw driver who was only concerned with ferrying people than with larger social causes. I nodded in agreement and hurriedly clambered off. A period of about two hours went by ‘without incident’ until it was time for me to plan my transport back home. I decided to try a recently introduced, airconditioned bus called the Red Line. I stood along with a bunch of other would be passengers at a bus-stop and waited my turn. I noticed there was an elderly Bengali couple close by who were anxiously trying to wave down an autorickshaw while waiting for a bus and a middle aged, differently abled man who seemed to be quite at ease waiting for the bus although he would have been far more comfortable sitting. Soon enough, the Red Line turned the turn and stood in front of us. I made way for the couple and the middle aged man and then got on myself. No sooner had I sat down that I felt the latter gesturing at me and when I turned to look in his direction, he winked and asked me to come and sit beside him. I was horrified of course and decided to look away. My horror was double fold of course — I had somehow, probably unfairly invested the guy with some kind of greater conscience since he was differently abled and I was of course repulsed by an unwanted and uncalled for gesture from an absolute stranger. A couple of minutes into the ride, a crowd of noisy school children jostled their way into the bus, a sight I always like. Life to me always feels incomplete without the commotion and untrampled enthusiasm with which children greet the smallest of adventures — in this case, a ride home after school. Typically, given the way they rushed in one of them, a young boy, nearly fell on the elderly, Bengali gentleman. He reacted loudly and angrily, pronouncing to all who could hear that SUCH (by which he meant, poor, government school attending) children should not be allowed into SUCH (airconditioned, more expensive and therefore in his view rightfully exclusive) buses. When he noticed a bemused smile on my face he asked harshly and accusingly if I was a school teacher. I said I wasn’t but that I was a mother — and he looked like he was about to say something to express his disapproval of my not knowing my rightful place next to him and his disdain but thought better of it. In any case, the journey resumed. Just a couple of minutes before the bus reached my stop, as I tried to peer outside the window across from my seat while studiously avoiding the attempts of said gentleman who was continuing to make a pass at me, I noticed a tall, regal looking man wearing a long, black kurta leaning fashionably carelessly against an old car at the line of car mechanic shops outside the gates to my neighbourhood. I couldnt believe my eyes! It was well-known Indian film director —Muzaffar Ali! And I thought to myself, my god! What a contrary, nutty and effervescent place this city is! All I need to do is step out of my door and I will never know what range of absolutely crazy people I will have occasion to meet or how many wonderful, acclaimed artists or otherwise not to be easily seen ‘celebrities’ I will chance upon in the least expected settings, least of all, the strapping Mr Ali at a grimy car mechanics shop!!! 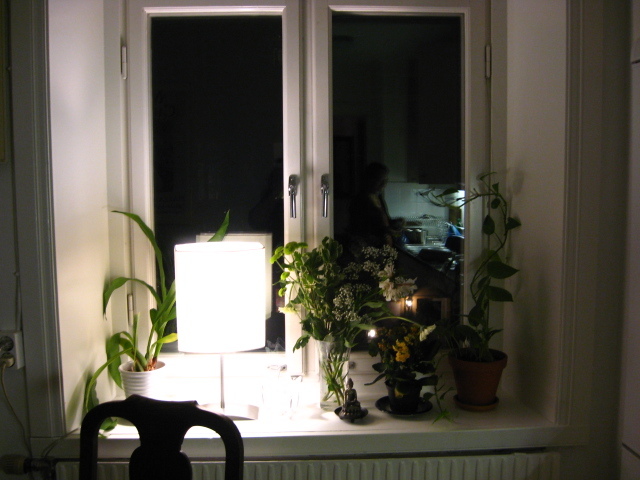 For a few days now, I’ve been reminded of a rather special and memorable evening with two dear girlfriends in my kitchen of yore in the Nordics when the man of the house was away on a work trip. The plan had been to persuade one of my friends, an ardent homebird and ever loyal and dutiful wife and new mother to get away for about two hours for an all girls evening at my place with some communal cooking and eating. I was heavily pregnant at the time and although moving around leave alone cooking or co-cooking Indian pancakes from scratch in that part of the world was an especially challenging task in that condition, I thought it would give us three something fun and new to do and I would of course get to gluttonously feast on the smells and tastes I was beginning to miss terribly. Once we had all gotten ourselves a fair number of pancakes on our plates and into our stomachs, and a delicious combination of lethargy and satisfaction starting setting in, our conversation moved swiftly as it always did to our men. Of the three, I was the only one in an inter national/racial marriage and we all knew that it was all the more exciting to spend a little extra time on probing me and goading me to spill out at least a few nuggets of ‘wisdom’ from my supposed vantage point in apparently ‘cracking’ it with so many more differences. I loved to shock them by quoting the Other Inhabitant of the House (OIH) and his surprisingly candid views on what he called the lot of men and the baggage of masculinity. One of the things he used to love to say was that I along with all other women he cared for should be ever grateful to have been spared being born male. He’d shake his head and say, “Rajya, you dont want to know what goes on in our heads, nearly all the time. And I mean the best of us. The ones you girls think are kind, gracious, well read and so on. Now, not that the OIH felt this way at all times or even remembered what he had said to me. But that he had said it at all! THAT to me was marvellous. And my girlfriends of course were in absolute awe that I lived with a guy who had the courage to say what he did and wondered for good reason whether the unusual candour and courage extended to include other parts of our life as a couple too. I still remember how proud I was while telling them about his candour and while enjoying an absolutely pleasant and wonderful evening with two intelligent, insightful and generous friends I felt a stab of longing for the OIH who was away at the time. You will not believe it if I tell you that so much has happened over the last three years that OIH and I dont live in the same house or country any more. And there is much to be said about the unfortunate and miserable ways in which a sparkly connection between two people can unravel. But I am able to see very clearly three years on from that evening, in the gathering gloom that define Nordic winters, that the jab of pride, joy and thrill one can feel while being entwined with someone, (no matter how entwined or not entwined the other person feels with you), is absolutely marvellous and is undoubtedly one of those few, necessary experiences everybody must subject themselves to — to just know, first hand, what immersion in another’s life, thoughts, habits, feelings is about. Although the demands of everyday life impinge quickly on this nearly spiritual experience, the moment and passage of immersion is worth ALL the heart break and sorrow and desolation that it inevitably wreaks, on oneself and others. The only exception to that, is perhaps the onset and responsibility of parenthood. Which is a whole another kind of immersion. Location: A spacious, three bedroomed, ground floor house in South Delhi that was famed in some circles for being aesthetically appealing with some quiet, Laurie Baker touches, now quickly coming undone under said toddler rockstar’s ferocious and high speed plunderings. T: Unimpressed. Surly. Starts to bang noisily on bed. R leaves the room in a dramatic huff. T immensely pleased, quickly recovers her dynamite, impervious rockstar toddler self.